DEFINITELY Spaz, no contest. His work is always outstanding. Chad's looks like it'd be a comfortable fit with the MMU art style, which to be honest I'm not really sold on. 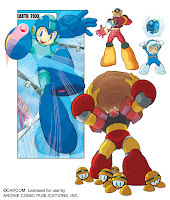 May not be a full showing of Wily there, but I do like how his clothes look. Darn, I said to myself that I probably wouldn't be getting an issue of this, but it just seems to be getting more interesting everytimes more art is shown. That's Spaz's art in the middle, right? If so, it's DEFINITELY Better than Chad's. When the comics were announced, I was expecting the worst. Spaz's art (assuming it's the center picture) showing up the next day definitely persuaded me otherwise. That style is the most crucial point here for me - if the comic doesn't look somewhat like what Spaz has done so far, it won't do. No disrespect to Chad, it's just not the right style. Whoever did the middle one wins for me. The other ones look fine, but the middle one looks really cool. although spaz is more of what we'd expect, i was excited to chad's style a little more fleshed out. it's definitely not fair to pit one against the other when they're at such different stages of production. i'd like to see some colored chad art. 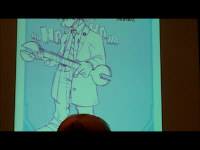 @RADIX: There were pictures of the TCG? I'm diggin' Spaz. 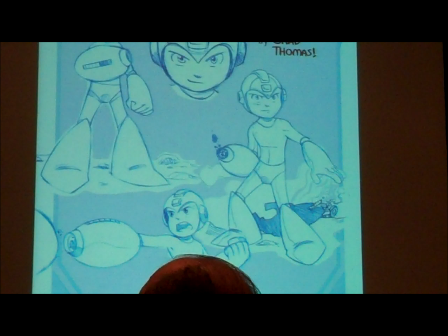 His work seems much more "traditional anime" than the other dude's... odd-faced Mega Man. Also, my verification word today is "plain". Spaz is perfect for this hands down. chad's art, while interesting, disappoints me and makes me feel he shouldn't even be involved in this at all. He just doesn't seem to depict them the way they were intended. @Dr. Jerk: Yeah; they're at Cardbaka382's site (you need to look for them through Internet Explorer, though; Firefox won't display the images). Looks a lot like the MM7/MM8 instruction manual artwork to me... I like it. Ok I know Ice Man is short but that's just absurd. Spaz's pieces weren't from a trading card game; just regular trading cards.